Categories: Methandienone oral (Dianabol), Oral. Tag: Alpha Pharma. 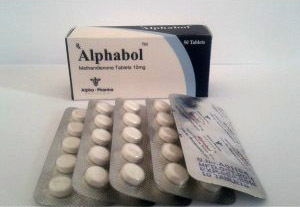 Alphabol by Alpha Pharma is an orally activated anabolic steroid known as Methandrostenolone, a derivative of Testosterone exhibiting strong anabolic properties and moderate androgenic properties. Alphabol is in fact a branded version of the now infamous Dianabol. 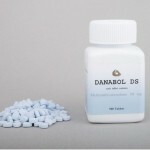 Dianabol was first made available back in 1960 and quickly gained notoriety by becoming the most commonly used anabolic steroid throughout the world of athletics. 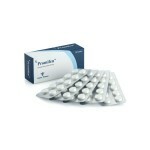 Fueling its meteoric rise to prominence was Dianabol is extremely easy to use not to mention extremely effective. It remained the dominant player in its market sector right the way through the late 80’s when the medical community decided there was no longer a legitimate use for Dianabol. The decision led to its removal from the shelves of pharmacies nationwide. However, despite this fact, Dianabol and branded versions such as Alphabol remains one of the most popular anabolic steroids in the world today. One of the standout characteristics of Alphabol is in its ability to quickly provide the user considerable gains in both mass and strength. At the same time however, its use brings with it the possibility of significant side effects. One such side effect is due to Alphabol being quite estrogenic, meaning gynecomastia is a concern, particularly when using high doses. Water retention can also be an issue as it gives you a smooth (softer) appearance, blurs muscle definition and makes you look fatter than you actually are. This can be combated with the addition of an anti-estrogen such as Nolvadex and/or Proviron. A better choice however, comes in the form of Arimidex, Femara, or Aromasin. Other possible side effects include oily skin, acne, body/facial hair growth and male pattern baldness. Alphabol is used primarily by men as strong virilization symptoms are a very real danger when used by women. 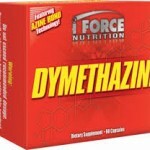 However, females can benefit from taking a low dosage of just 5mg per day for significant gains in muscle mass. Most men take between 20 to 40 mg per day and can achieve some pretty dramatic results. Of course there are always some who will take higher doses however, this will also increase the likelihood and severity of side effects. Alphabol combines well with most forms of injectable steroids, although it is most commonly used alongside Testosterone Enanthate Deca Durabolin. 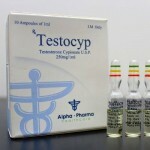 Its ability to quickly add mass and increase strength makes it a great way to kick start a cycle consisting of the longer ester injectable steroids like Deca, Testobolin etc. As was already mentioned above, it would be wise to keep some type of ancillary drug on hand in order to prevent any estrogen related side effects associated with this kind of cycle. Alphabol has a relatively short half-life lasting approx. 3 to 4 hours, therefore it is suggested that one should split the dosage taking half in the morning and half in the evening. This will help keep blood levels more consistent and avoid levels varying up and down throughout the day.